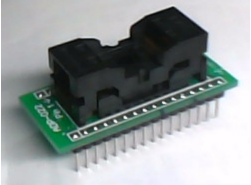 This TSOP32 (S) adapter is a standard EPROM progrmmer adapter. It will accept (8mm X 14mm) body width TSOP32 chips, such as SST39SF020A, SST39SF040, SST39LF512, SST39LF010, SST39LF020, SST39LF040,SST39VF512, SST39VF010, SST39VF020, SST39VF040 etc. It is widely used in many different programmers. It can be used on: All willem/TOP853/TOP2004/TOP2005/TOP2048 programmers, EasyPro programmer, SuperPRO and other programmers.